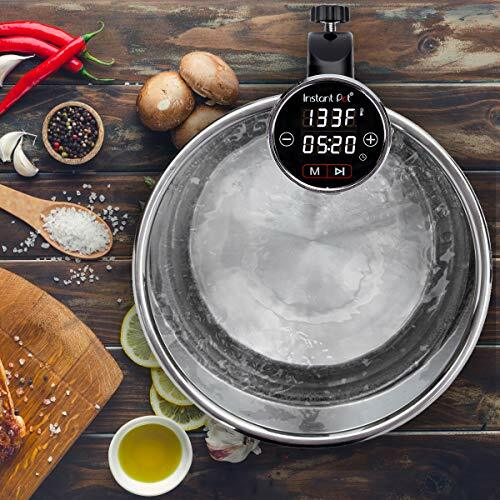 The pro chefs and culinary connoisseurs may have finally found a way to cook food to perfection every single time with sous vide cooking, and it is now rapidly becoming popular among non-professional foodies as well. In case you are still confused about what sous vide is exactly, it a cooking technique that makes use of precision control in temperature to produce consistent and professional quality results to your food. Upscale restaurants have been using sous vide cooking for years to serve their patrons food exactly how their customers preferred it every time. The technique has become very popular in home kitchens thanks to sous vide cooking equipment now made widely available and affordable. Simply put, sous vide is a French term that means under vacuum. It refers to the vacuum sealing process of food in a bag, then cooking it to an extremely accurate temperature in a water bath. This vacuum technique allows cooks to produce results that they can’t otherwise achieve using traditional cooking methods. With sous vide, the food cooks slowly and evenly, and as a result, you get perfect texture and excellent flavor each time. The sous vide technique started in Europe and is a preferred method of cooking among French culinary experts. It has allowed them to get unparalleled precision and consistency to their restaurants. Many professional chefs even celebrity chefs have become sous vide enthusiasts over the years. In the 1970’s a chef named George Pralus perfected the technique to prevent wasting products when it comes to preparing foie grass. It was soon discovered that when you cook food with the sous vide method, the food loses less than 20% of its original weight which means more nutrients are retained. On the other hand, traditional cooking methods like frying, roasting, and grilling results in food losing 30% of its weight. They have prevented product loss using the sous vide method because the food is packaged or under vacuum and is subjected to lower cooking temperatures. That is why there is a significant difference in the reduction of water and fat loss in the food. Using the sous vide method, the food is immersed into a water bath with a precisely controlled temperature because the temperature of the water is the same as the target temperature of the food. The water temperature is not hotter than the desired temperature that you want to achieve so the food is never overcooked. Sous vide produces results that are nearly impossible to achieve using other cooking methods. Sous vide reduces stress, time constraints, and concerns of overcooking. It also allows beginners or home cooks who have nearly no experience to prepare a perfectly cooked medium-rare steak even for the first time. Using the precision in temperature control and consistent temperature while cooking in the sous vide method allows you to cook food to an even doneness the whole way through. There will also be no dry edges in steak or rare centers. You will get professional results, with steaks emerging from the bag perfectly juicy and pink every time. Although the time it takes to cook may be increased, you can use that time to do more important things since you don’t have to watch the food cooking or flip the steak every once in a while. Professional chefs suggest flipping your steak every minute and with sous vide, you don’t have to do any of that. You can leave the food in the water bath for hours while you run your errands and do other chores. Your food will not be overcooked no matter what even if you leave the food in the bath longer than you intended. You can leave and come home to perfectly cooked food. No hassle! There is very little margin of error. Conventional cooking gives you the risk of overcooking or sometimes, undercooking your food. That doesn’t happen in sous vide cooking. The food is cooked to perfection all the time. You can achieve uniform doneness with no gradient and no overcooked outer portion. You get the entire food in a uniform temperature and doneness. There is nothing to throw away. The sous vide method is perfect for cooking seafood which oftentimes fail if you don’t watch it closely. Frying fish can often result in overcooked edges than the center. So how do you cook sous vide style? It’s not as hard as you may think and you can easily do it at home. Here are just the basic steps. All you will need is your precision cooker. First, get your precision cooker and attach it to a pot of water. Set the time and temperature to your preferred level of doneness. Put the food that you want to cook in a sealable bag called the vacuum. In other words, vacuum seal the food and clip it to the side of the pot. Now all you have to do is leave the food to cook for the time you have set. Remember, you don’t have to worry about overcooking the food even if you leave it longer than intended. Now you can finish off cooking the food by searing, grilling, or broiling it to add a crispy layer on the exterior. This step is optional and you absolutely do not need to do this unless you prefer. Noting all the advantages in ease of cooking and restaurant quality results in sous vide method, it’s easy to understand how the sous vide revolution came to be.